The Assist Trophy as it appears in Super Smash Bros. Ultimate. The Assist Trophy (アシストフィギュア, Assist Figure) is an item introduced in Super Smash Bros. Brawl that, when picked up, breaks open and summons a random Nintendo or third-party character to aid the user. Assist Trophies work very similarly to Poké Balls. However, no Pokémon come out of them, and once an Assist Trophy is grabbed, it is automatically activated, assuming the holder is standing on the ground, and not in a jump, attack, or hitstun. Some Assist Trophies must be unlocked in order to be used, such as Gray Fox from Metal Gear. Unlike the Poké Ball, this item can be eaten by moves such as Kirby and King Dedede's Inhale, and Munchlax. The majority of Assist Trophies in Brawl are undamageable, with only Starfy and Lakitu being able to be interrupted or otherwise hit or even KO'd. In Super Smash Bros. 4, however, some Assist Trophies can be attacked, potentially interrupting their attacks or otherwise manipulating how they perform and even being able to KO them (this can be seen by their ending animations coming earlier than normal, them having their own death animation, or simply teleporting away). However, there is no reward for KOing an Assist Trophy. In Super Smash Bros. Ultimate, more than one Assist Trophy can be on the stage at once. A larger number of Assist Trophies are also made able to be KO'd, which grants the player who KO'd them one point. When the Assist Trophy is close to becoming KO'd, the player who summoned it can KO it to prevent other players from gaining a point. Nintendog A "Nintendog" blocks the screen. Its breed varies by game. In Brawl, it's a labrador retriever. In Smash 4, it's a French bulldog. In Ultimate, it's a toy Poodle. Tingle Randomly enacts one of a variety of strange effects. It also takes longer for more Assist Trophies to spawn after his appearance than any other character. He can inflate lots of balloons and float off the stage. The balloons can lift characters, but do not deal damage. He can cause a Hammer and Golden Hammer shower, spawning lots of these items on the stage. He can create a Banana Peel effect. This makes all fighters on the ground (including the summoner) slip repeatedly until Tingle disappears. He can burst into flames, which gives everybody a Superspicy Curry effect. He can produce a flower graphic, and zoom the camera in on the summoner until he leaves. ↑ 1.0 1.1 1.2 1.3 Became a fighter. There are 27 Assist Trophies in Super Smash Bros Brawl. Little Mac 30 Little Mac runs and jumps around, attacking with powerful jabs and uppercuts. Punch-Out!! Tingle 30 Tingle randomly enacts one of a variety of strange effects. It also takes longer for more Assist Trophies to spawn after his appearance than any other character. He can create a Banana Peel effect. This makes all opponents on the ground slip repeatedly until Tingle disappears. In addition to the above characters, scrapped Assist Trophy data for Ridley was found when hacking Super Smash Bros. Brawl. In the final game, he was a boss in The Subspace Emissary. Assist Trophies return in Super Smash Bros. 4 with a more iridescent design and a softer "popping" sound upon use, instead of the glass-shattering sound effect it had in Brawl. Unlike in Brawl, where all Assist Trophies apart from Starfy and Laiktu could not be damaged nor defeated, several Assist Trophies can now be KO'd, including several returning ones who could not be attacked in Brawl. There are 39 Assist Trophies in total, with 21 new assists and 18 returning from Brawl, but with 9 assists cut from Brawl. Both the 3DS and Wii U versions include exactly the same Assist Trophies, and unlike in Brawl, there are no unlockable Assist Trophies. For the first time in the series, multiple Assist Trophies can appear at once. Players are rewarded points in Time battles when KOing a defeatable Assist Trophy. Occasionally, opposing Assist Trophies may fight each other. They can also now be affected by status effects such as freezing. Assist Trophies also respawn if they fall off the stage accidentally. The item itself reuses the rainbow dome from SSB4. There are 59 Assist Trophies available in the game, with 27 new assists and 32 returning from Smash 4 (Including 2 assists who were in Brawl but not Smash 4), but with 9 assists cut from Smash 4. On some stages, certain Assist Trophies won’t appear, such as gimmicks that affect the Assist Trophy, the Assist being a background character, or even Alucard not appearing in front of a mirror. The Assist Trophy trophy in Brawl. A capsule that contains characters who will help you out in battle. You won't know who's in the capsule until you open it. It may be someone everyone knows or someone who's a bit of a mystery. The majority of these characters are invulnerable, so attacking them is not an option. You know what that means, right? RUN! Assist Trophy trophy in Super Smash Bros. for Nintendo 3DS. Assist Trophy trophy in Super Smash Bros. for Wii U. A mystery capsule containing a guest character who'll stand by you in battle. You won't know who's in it till you open it! It could be almost anyone from all sorts of games - a famed warrior or a slightly loopy sidekick! Whoever it is, you can't control them, so you'll just have to trust them. Little Mac, Dark Samus and Isabelle are the only Assist Trophies in the series to become playable characters in later installments. Isaac and Gray Fox are the only Assist Trophies to skip an installment in the franchise and return in a later game. Ironically, both were treated as "newcomer" Assist Trophies on the Ultimate website. Gray Fox is the only Assist Trophy in Brawl cut in Smash 4 to be from a universe with a playable character (as Animal Crossing did not have a playable character in Brawl). Andross, Devil, Dr. Wright, Hammer Bro., Jeff, Knuckle Joe, Lyn, Metroid, Nintendog, Samurai Goroh, Shadow, Starfy, and Waluigi are the only Assist Trophies to appear in more than two games since their introduction in Brawl. Likewise, Infantry and Tanks, Kat & Ana, Lakitu and Spinies, Saki Amamiya, and Tingle are the only Assist Trophies that have appeared in two installments, but absent in Ultimate. The Yoshi and Pokémon series are the only two franchises with playable characters in every installment to lack Assist Trophies. Other series that share this distinction but debuted later are Ice Climber, Game & Watch, R.O.B., Wii Fit, Punch-Out! !, Mii, Duck Hunt and Final Fantasy. Because the Pokémon series uses Poké Balls instead, the Yoshi series is the only one to lack any assist characters whatsoever. Final Fantasy is the only third-party universe to not have an Assist Trophy. Dillon's Rolling Western is the only Assist Trophy-only universe introduced in Super Smash Bros. 4 to have solely been developed by a second-party developer (being Vanpool). However, Kaeru no Tame ni Kane wa Naru, while primarily developed by Nintendo R&D1, was co-developed by Intelligent Systems. Hammer Bro is the only Assist Trophy character to appear as an enemy in the Subspace Emissary. It is also one of five Assist Trophies to appear as an enemy in Smash Run, along with Starman, Lakitu and Spinies (albeit using their 3D designs), Chain Chomp, and Metroid. Not counting the Nintendog (which becomes a completely different individual breed in each installment), Dillon is the only Assist Trophy to receive a substantial aesthetic change in his appearance between installments, as in SSB4 he was based off of his appearance in Dillon's Rolling Western and its sequel, while in Ultimate, he is based off of his Dillon's Dead-Heat Breakers appearance. In Brawl, the Mario universe is the only universe to have more than one Assist Trophy. In Super Smash Bros. 4, it is tied with The Legend of Zelda for the most Assist Trophies, with four. In Ultimate, it has the most Assist Trophies, with five. As such, it is the only universe to have always had more than one Assist Trophy. Prince Sablé, Sukapon, Jill, Ray Mk III, Yuri Kozukata, Magnus, and Phosphora are the only Assist Trophy characters that have appeared in only one game outside of their Smash appearances. Shovel Knight is the first and (as of Ultimate) only Assist Trophy from an Indie game developer. Shadow the Hedgehog is the only Assist Trophy to have his voice actor change between Brawl and Smash 4. The Mega Man franchise has the most Assist Trophies out of any third party franchise, at 3, with Elec Man appearing in Smash 4, and Zero and Wily Capsule appearing in Ultimate. The Animal Crossing franchise is the only franchise to have a different Assist Trophy in each game, with Mr. Resetti appearing in Brawl, Isabelle appearing in Smash 4, and Kapp'n appearing in Ultimate. In Brawl's Classic Mode, if the character who summoned an Assist Trophy is KO'd, the Assist Trophy disappears. However, this does not happen in All-Star Mode. In the Smash Direct for SSB4, Waluigi was shown as a Wario series Assist Trophy, despite never appearing in a Wario game. By the game's release, he is corrected to represent the Mario series, like in Brawl. 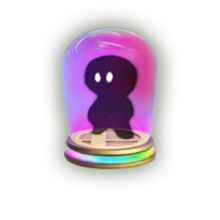 In SSB4, the silhouette figure within the Assist Trophy capsule will occasionally blink its eyes. Magnus and Elec Man are the only Assist Trophies to have appeared only in Super Smash Bros. 4 and not have come back in Ultimate, excluding the assists-turned-playable Isabelle and Dark Samus. Attendants at the 2007 Whobby Game Festival who played a demo of Brawl claimed to have seen Assist Trophies of Duster from Mother 3, Muddy Mole from Mole Mania, and Rosalina, but the veracity of the claims was never proven, and there is no evidence in the final game that these characters were ever planned. Similarly, attendants of E3 and players of the Smashfest event claimed to have seen Chunky Kong as an Assist Trophy in Super Smash Bros. 4, although he was not seen in any following public demos, and is absent in the 3DS and Wii U version of the game. Prior to the Ultimate 2.0.0 Update, If two Isabelles used Fishing Rod to grab onto an Assist Trophy, one would grab on, and the other would not; however, the result would be the former infinitely spawning the same Assist Trophy until she got hit. Not counting Rathalos, who is fought as a boss, Rodin, Black Knight, Samurai Goroh, Phosphora, Thwomp, Spring Man, Starfy, and Moon are the only Assist Trophy characters not to appear as Assist Trophy enemies in Spirit battles. Knuckles can't be summoned in Green Hill Zone due to being a background character in that stage. Kapp'n can't be summoned in Smashville, Town and City, or Tortimer Island due to being a background character in these stages. Moon can't be summoned in Great Bay due to appearing as a background character in that stage. It also can't appear in any large, flat, transforming, or indoor stage. Nikki can't be summoned in Final Destination likely due to her drawings blending in with the background. Andross can't be summoned in certain stages most likely due to conflicts with certain stage backgrounds. Alucard can't be summoned in Wii Fit Studio due to the presence of mirrors (as vampires do not have reflections). Skull Kid cannot be summoned on Spear Pillar due to his effects conflicting with the effects of Dialga and Palkia. Devil cannot be summoned on 63 different stages for unknown reasons. This page was last edited on April 19, 2019, at 21:49.